It's Caitlin, talking about my friend Melissa's wedding again. But first, let me tell you that I went to another wedding this weekend that had an amazing cheese table. They made a tough choice - they picked a fancy cheese table over an oyster station. Jesse told me the news pre-wedding and I was elated. Downright giddy with anticipation. Jaisa has shared her wedding's insane cheese table, too. I guess my point is, when in doubt, choose cheese. Everybody will go crazy for it at your wedding. Or at your backyard party. Or at dinner tonight. So back to Melissa's wedding. I'll open, naturally, with the cheese. Tasty, evenly cut, and paired with fruits (that makes it healthy). You can see that alongside the cheeses, there was what basically amounted to a killer design-your-own-bruschetta station. Marinated artichokes, a rapini & white bean mix, and classic tomato & garlic. Plus olives, meats, and a few spreads. While I think this is pure genius for a wedding, I want to have one at my next house party. And then there were the passed appetizers and the other appetizer stations. Fish tacos. Sliders. Kielbasa Wellington, which made me reconsider my vegetarianism. 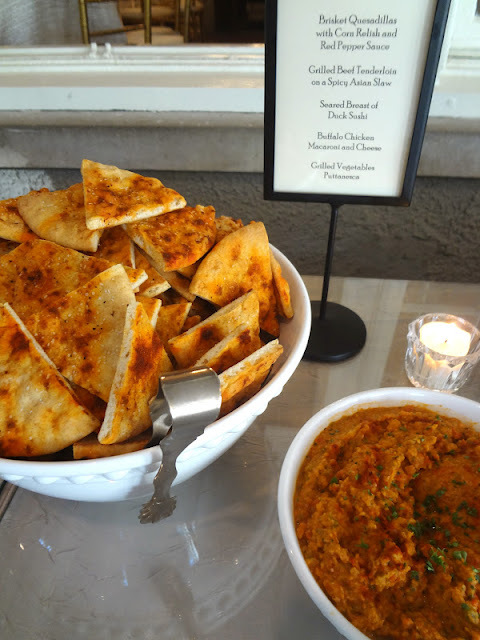 Usually appetizers happen during cocktail hour at a wedding and, in my ever-growing wedding experience, it makes a huge difference in whether your guests get belligerently drunk before it even gets dark. Trust me - go with the hearty, tasty appetizers that everybody will want to try. Happy guests who aren't blacked out by 9 PM. Perfect wedding, amazing food. Don't these pictures make you glad wedding season is just kicking off? Stay hungry! GET OUT OF TOWN. This looks AMAZING!!!!!!!!!!! This article about Appetizers For Wedding Reception may be interesting for readers..